Worlingham is a suburb of the fine town of Beccles, and the bypass which takes the road to Yarmouth around the north of the town also bypasses Worlingham, giving it a peace that it has probably not known for several generations. Having said that, the wide road here encourages thoughtless speeding: a few days after Peter and I visited this church in October 2009, a car ploughed in to a group of school children waiting on the verge. It was a miracle that nobody was killed. Worlingham is not without its charms. Principal among them is All Saints, in its pleasantly trim graveyard boiling with trees. The lychgate onto the road serves as the war memorial (as at nearby Shipmeadow) and commemorates nine sailors lost at sea - we often forget that, in parishes as close to the sea as this, young men were as likely to sign up for the navy as for the army. Solid trees overhang the path, creating a tunnel effect up to the north porch. Somewhat surreally, a large painted duck sat on a pedestal beside the path, a temporary feature of the Beccles Duck Festival, apparently. Worlingham parish church is not a place to come to if you are looking for quaint medieval rusticity, because the impress of the Victorian restoration here was a firm one. 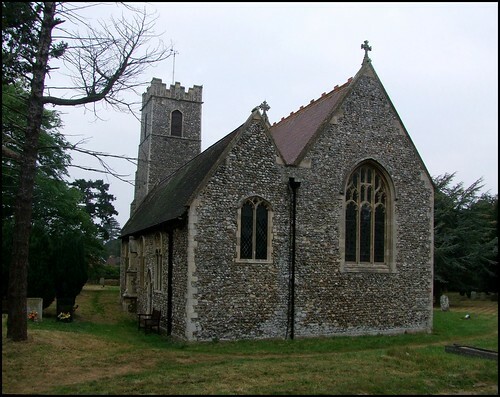 It was the work of Sir Arthur Blomfield, a man who did some very good things in Suffolk ; major works in the county include Ipswich St John the Baptist, Felixstowe St John the Baptist and the complete restoration of Alderton. And this is a good one, too, albeit rather urban in character. Wandering around to the south side, there is a surprise. The chancel has a south aisle, but the nave doesn't. Somerton and Benhall have something similar, but in general an aisle would have run the full length of the church. Was it unfinished? Not impossible, since it dates from the 14th century, and might have been the victim of the Black Death. More likely, though, it was always meant this way. Tucked away behind it, in the south nave wall, is a recess and tomb chest. Above it, the coat of arms is for the Playters of Sotterley Hall. I wonder if it was always outside, or if Blomfield put it here. Nearby, a large headstone bears the crest of the Denbighshire Hussars, who were based in the Beccles area during the First World War. It remembers three soldiers killed in local accidents. When I first visited in 2002, I found the doors to the church locked, but today this church is open every day, for which the local benfice are to be thanked and congratulated. As with most churches in this area, the first impression is of stepping into a tunnel-like space, except that here of course the chancel opens out, and there is a secretive little space off to the south. This choir aisle contains a most splendid memorial to Robert Sparrow, who died in 1805. It shows a grief-stricken figure leaning on the pedestal of an urn, and is by Sir Francis Chantrey, something of a surprise to find in this otherwise High Victorian interior. There are a number of other interesting wall plaques in the same area, probably collected together here by Blomfield. The large 15th century font dominates the west end of the nave, and there is excellent late 19th Century glass throughout, mostly by the Clayton & Bell workshop. I liked the Annunciation in the choir aisle best.All in all, this is an interior of the highest quality that the late 19th century has to offer, if a little urban and anonymous compared with what must have been here before.